Missing in Storm: Have You Seen Coney’s Mama Burger? Have you seen Mama Burger? It seems that she was swept off the roof of Paul’s Daughter on the Coney Island Boardwalk by Hurricane Sandy. We’re not sure of her exact size but she’s smaller than Papa Burger who anchors the other end of the roof. He is 10 feet tall, 6 feet wide, and weighs 250 pounds. The Burger figures known as the A & W Root Beer Family were first made in the 1963 and are catalogued on Debra Jane Seltzer’s website roadsidearchitecture.com. On Tuesday, Mama’s burger was spotted at West 15th Street by a photographer but Mama herself remains a missing person. Tina Georgoulakos, owner of Paul’s Daughter, wrote in an email to ATZ: “She must have blown away, We don’t know where she is. After all these years! !” If you find her please contact Paul’s Daughter at 917-607-4960 or via Facebook. Oh no! Come back, Mama Burger, we love you. That is some totally awesome signage! It almost makes me think “the bigger, the better”! I saw the photo of the burger. Did they, at least, save that? I saw the burger in a photo. Was that saved? So nice to see Paul’s Daughter open for business today. Their fries were delicious as always! Did anyone ever find the burger???? Nope. Tina –Paul’s daughter–said they looked in all of the places where it was seen in the photos and other places nearby but the burger was nowhere to be found. Perhaps they can enlist an artist to make a new piece of food art for the statue to hold. 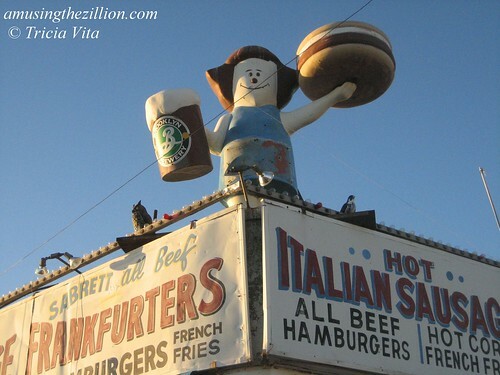 It’s now 2015, did you ever recover the burger and or root beer mug for Mama Burger at Paul’s Daughter, Coney Island? No, those items were never recovered. Probably thrown out with the debris from the storm. Mama Burger was damaged and is still awaiting repairs, so she has not yet returned to her spot on the roof opposite Papa Burger.